Surrounded by tropical fruit trees and swaying coconut palms, Stain Glass Cottage enjoys a quiet location in South Goa just 5 km from the cultural capital of Margao. 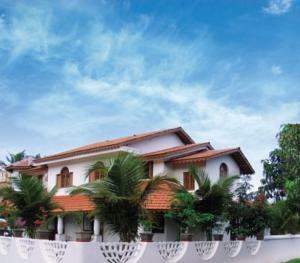 This charming home-stay in Colva features Goa-Portugese colonial architecture. It offers just 5 rooms, each unique in design but sharing the beautiful views of the landscaped gardens. Fitted with either a ceiling fan or air conditioning, each comes with a seating area and attached bathroom with hot water showers. Stain Glass Cottage is 2.5 km from Colva and Betalbatim Beach. It is a 30-minute drive from Goa International Airport. Free parking is available. The common lounge area features a cable TV and Hi-Fi music system. Guests can also read books at the library or enjoy a game of chess. Portable DVD players are available for rental. A daily breakfast is available at the shared dining area. It serves eggs cooked-to-order, local breads, cereal and Indian-style breakfast. Tea, coffee and fruit juice are also served. Free! Up to two further children under 3 years stay free of charge when using existing beds. One child from 4 to 6 years is charged 50 % of the room stay per night in an extra bed. One older child or adult is charged INR 1000 per night and person in an extra bed. Maximum capacity of extra beds in a room is 1. Any type of extra bed or child's cot/crib is upon request and needs to be confirmed by the hotel. Supplements will not be calculated automatically in the total costs and have to be paid separately in the hotel.